The Levy affects all businesses with an annual payroll in excess of £3m and requires them to pay a percentage fee of their Pay as You Earn (PAYE) wage bill. As the largest Apprenticeship provider in Dorset, you can be assured that we have the extensive experience to ensure we give you the best advice and support through this significant change. The Levy is charged at a rate of 0.5% of an employer’s annual payroll over £3m and will be collected by HM Revenue and Customs (HMRC) through Pay as You Earn (PAYE). The Levy needs to be paid by larger organisations regardless of whether they reclaim vouchers for Apprenticeships. Levy funds can only be used towards the cost of an Apprenticeship with an approved training provider. It cannot be used for internal training or to pay an apprentice's wages. All new and existing Apprenticeships will be placed into one of 15 funding bands. The limit of these bands range from £1,500 to £27,000 and employers are expected to negotiate a price for Apprenticeship training. Funding bands will cap how much the Government will 'co-invest' if an employer has insufficient funds from their Levy payments to cover the number of Apprenticeships they want to use. 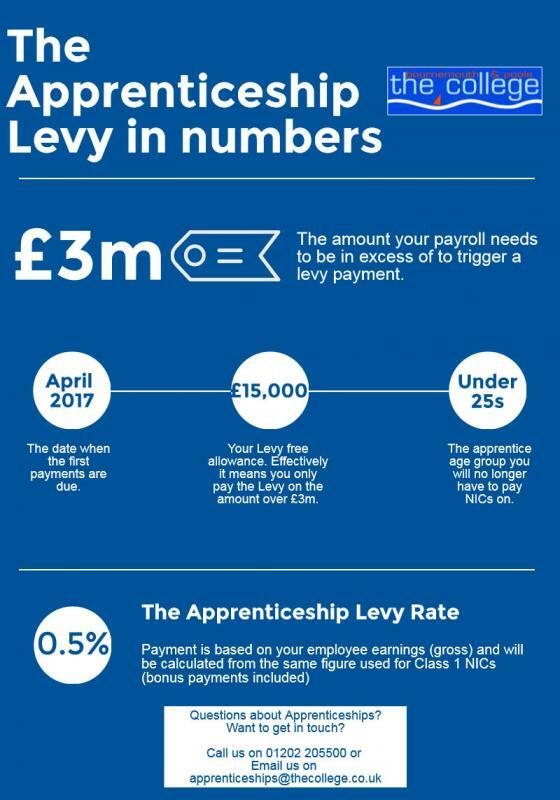 Levy payments are managed through the Digital Apprenticeship Service and are held in a 'Digital Account'. You can reclaim funds for Apprenticeship training in the form of a digital voucher (e-voucher). Employers will have 24 months to use their Levy funds and payments will automatically be deducted from the oldest contribution made into the Levy. It's simple, if you don't use them, you will lose them. There is £1,000 incentive for employing an apprentices aged 16-18. This would also apply to 19-24 years olds who have left care and young adults with additional learning needs. There will be a 20% uplift to training providers for 16-18 year old apprentices, or 19-24 year olds who have left care and young adults with additional needs who are on an Apprenticeship framework scheme. The payments will come directly from the Government and will not be deducted from an employer's digital account. The Government will apply a 10% top-up to monthly funds for employers who are committed to Apprenticeships and pay the Levy. Employer has 250 employees, each with gross salary of £20,000p.a. If you're an employer with an annual payroll of £3m or less, then you won't pay into the Levy. You will continue to pay your provider directly for Apprenticeship training. It is proposed that all employers will access the digital account by 2020. The Government will co-invest towards Apprenticeship training, so non Levy-paying employers will contribute 10% towards the cost of Apprenticeship training and the Government will pay 90%. For employers with fewer than 50 employees, the Government will waive the co-investment element if these employers take on a 16 to 18 year old apprentice - the cost of training a young person will be free. Funding bands will cap how much the Government will 'co-invest' if an employer does not pay the levy.